We can all feel the change in season as warmer temperatures melt away the blanket of snow that covers the landscape. Soon, what is underfoot will be revealed again. At the New Brunswick Museum Exhibition Centre, Barbara Safran de Niverville, artist from Riverview, NB, will share her beautiful drawings dedicated to just that. 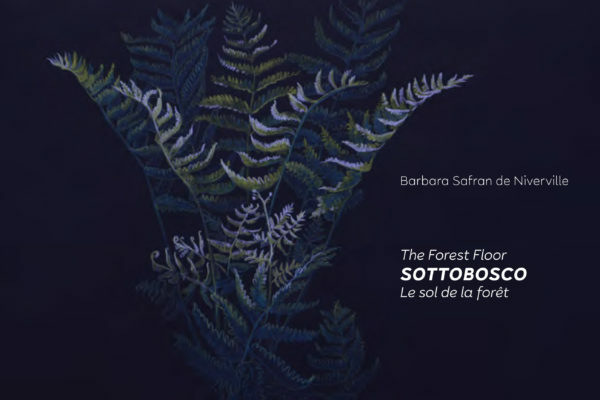 Her exhibition, Sottobosco – The Forest Floor, explores the fragile layer of flora, fauna and geology in its shadowed environment just above the roots of the trees. Safran de Niverville has chosen to work in coloured pencil on a black background for the subtle effects that she can achieve as details from the undergrowth emerge from the darkness. These drawings record an investment of time, contemplation and appreciation of the unassuming yet necessary beauty of the world around us. New Brunswick Museum is reviving a successful 1950s exhibition program, Meet the Artist, in a new series of small shows that highlights the work of artists from around the province and presents them to new audiences so as to encourage awareness, dialogue and conversation.